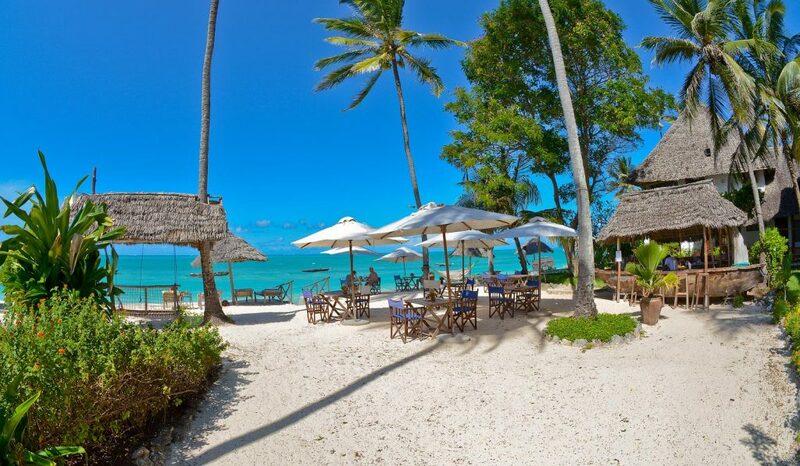 Blue Oyster Hotel features traditional Zanzibari furniture and tile floors, the airy rooms come with free Wi-Fi, mosquito nets and ceiling fans, as well as balconies with views of the Indian Ocean or the property’s tropical gardens. There’s no air-conditioning. Amenities include massage treatments and a library, as well as a beach bar and an international restaurant with a sea-facing balcony. The property offers local tours and fishing or sailing excursions. The hotel provides an unforgettable holiday experience. We are currently offering 15 rooms, either classic sea view rooms with stunning views of the Indian Ocean or budget-option garden view rooms. 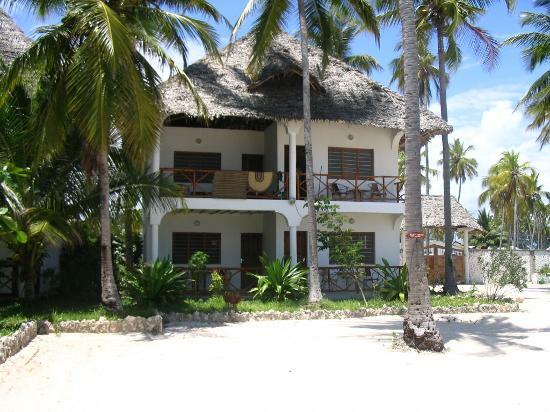 11 Sea View rooms are equipped with traditional Zanzibari furniture made of local materials. Naturally, the carved, wooden Zanzibari king-sized beds come with mosquito nets. Your ensuite bathroom contains a shower and a toilet. Further furnishings of the 20-square-meter rooms include a table, wardrobe and fan. Enjoy the sunrise on your balcony and wake up to the sounds of the Indian Ocean. Our Sea View rooms will spoil you with wonderful views of the turquoise water and our tropical gardens. 4 Garden View rooms are situated around the courtyard and are only steps away from the ocean. 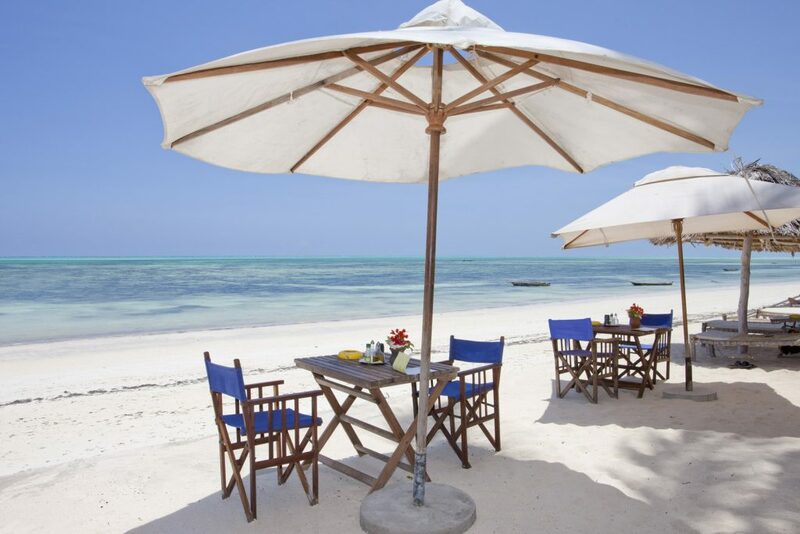 They are equipped with traditional Zanzibari furniture made of local materials. 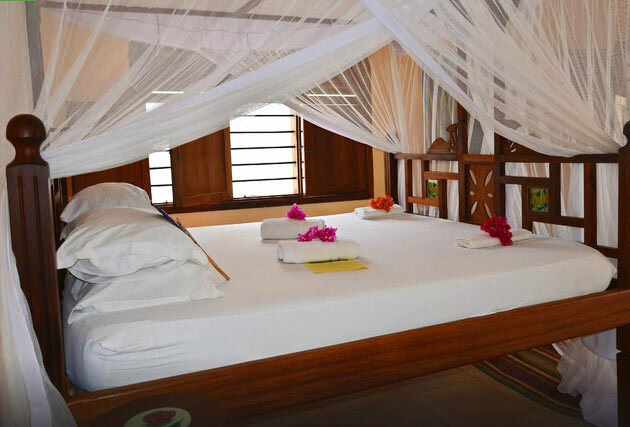 Naturally, the carved, wooden Zanzibari queen-sized beds come with mosquito nets. Your ensuite bathroom contains a shower and a toilet. Further furnishings of the 14-square-meter rooms include a table, wardrobe and a fan. Start the day on the patio surrounded by tropical plants in one of our budget-friendly Garden View Rooms.